Rome has always honoured its dead people, by praising the virtues and their tasks, performed by the dead people during their lives. Rome has buried since the ancient times Popes, emperors, king, writers and poets. Many famous personalities have lived in their walls. 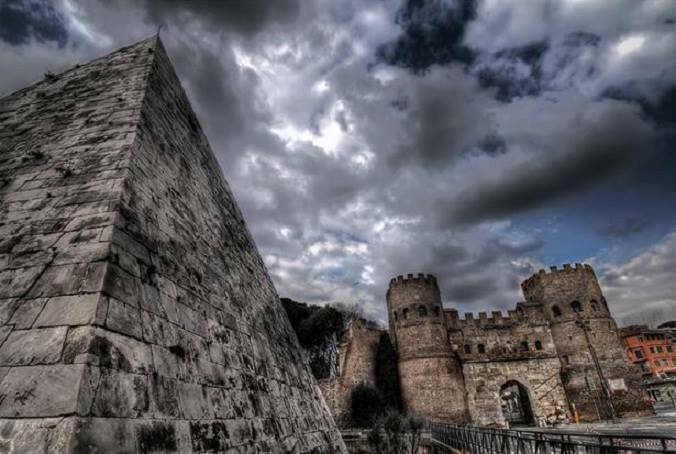 Four pyramids were built in Rome, but the only which survived after 2000 years of history is the Pyramid of Cestius, built between 18 and 12 b.C. (29,50 metres each side 36,40 metres high). It is a sepulchral building, with one inner space, 6 metres long 4 metres large, built to host the body of Caio Cestio Epulone and was erected during 330 days. You can’t miss the Mausoleum, such as the mausoleum of Augustus, 28 b.C, 87 metres long, or the mausoleum of Hadrian, where now you can find Sant’Angelo Castle, and, the Mausoleum of Cecilia Metella, along the Appian Way, 30-20 b.C, and the Mausoleum of Saint Constance turned in church in 1254, or the recent ones, such as the Mausoleum of the Ardeatine Caves, realized in honour of the 335 victims, dead because of the Nazi retaliation, a massacre ordered following a partisan action which took place at Via Rasella in 1944. The same Pantheon hosts famous personalities such as Raphael, Annibale Carracci, the King Victor Emmanuel II and his son King Humbert I. The Vittoriano, which is the grave of the “Unknown Soldier” (since 1921), commemorates and celebrates the soldiers who are dead during the I World War. Almost all the Popes are buried in the Roman churches, and also some Saints, famous personalities and artists such as Bernini, Borromini, are buried in the Roman churches, which are hundreds. The “Church of the Capuchins” in Saint Mary of the Conciliation, is very suggestive and its crypt-ossuary is decorated with the bones of 4000 friars Capuchins. Among the less famous graves, we can mention that of Anita, the young fiancée of Giuseppe Garibaldi who is buried at the Janiculum, under the statue where she is represented escaping on a horse. You can also visit the graveyards, the ancient Catacombs, cemeteries situated underground to host the remains of the first Christians. They are situated along the consular roads: Appian way, Aurelian way, Salarian way etc. or modern such as the monumental cemetery of the Verano; built along the via Tiburtina during the Napoleonic reign of 1805-1814. It is, with its marmoreal stones, a real masterwork, an incomparable open-air museum, for the amount and particular historical, artistic and cultural evidence. The Teutonic Cemetery placed next to the Vatican, and the “Cimitero Acattolico”, also called the “Cemetery of artists and poets” near St. Paul’s gate, a real proof of the amount of famous characters willing to live and die in Rome.